BRANDON, Man. — Brandon University (BU) sociology professor Christopher J. Schneider has received some nice accolades for his research contributions. Schneider is this year’s recipient of the Early-in-Career Award, given by the Society for the Study of Symbolic Interaction (SSSI) to “scholars who have made significant contributions within the first ten years since the completion of their PhDs.” The SSSI is an international group of scholars who study social issues “with an emphasis on identity, everyday practice, and language.” Simon Gottschalk, Professor of Sociology at the University of Las Vegas, presented Schneider with the Award at the SSSI Awards Banquet in Seattle. Schneider’s research investigates media and information technology, and their role in emerging developments in social control. Schneider has published one sole-authored book, one co-authored book, two co-edited books, two co-edited special edition journals, along with more than two dozen journal articles and book chapters. His recent book Policing and Social Media: Social Control in an Era of New Media (Lexington Books | Rowman & Littlefield 2016) has attracted considerable attention in mainstream press, including dozens of interviews and reviews in Maclean’s Magazine and the Vancouver Sun. The book investigates how social media platforms have affected the public face of police. Schneider has also received a pair of prestigious invitations from other universities. 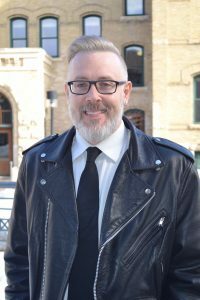 In November, he will hold the Public Visiting Scholar position in the Department of Criminology at Wilfrid Laurier University (WLU) in Brantford, Ont. The new position is offered to a scholar with “innovative research with public appeal.” Schneider’s work uses an innovative qualitative research design to address new challenges when working with social media materials. Schneider’s research and commentary have been featured in hundreds of news reports across North America. His duties at WLU will include a public lecture, classroom presentations, consultations with graduate students, and media analysis workshops. Schneider has also been invited to hold the Endowed Chair of Criminology and Criminal Justice position at St. Thomas University (STU) in Fredericton, N.B. The Endowed Chair is a distinguished research position that is “offered to a scholar with a well-established record of research.” Schneider’s duties will include public lectures on policing and social media, and lectures and workshops for students and researchers at STU. “Dr. Schneider is a tremendously dedicated scholar, whose research in crime, media and social control resonates strongly in this digital age,” says BU Dean of Arts Demetres Tryphonopoulos.